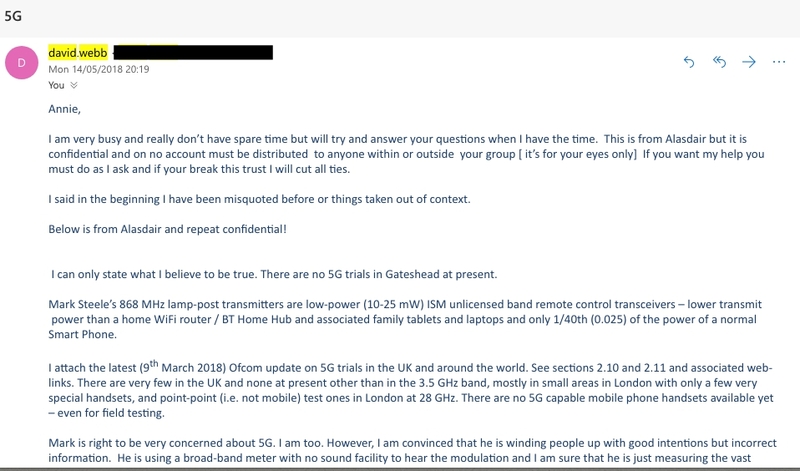 GATESHEAD 5G TEST RESULTS : THE WHO,WHY AND HOW! 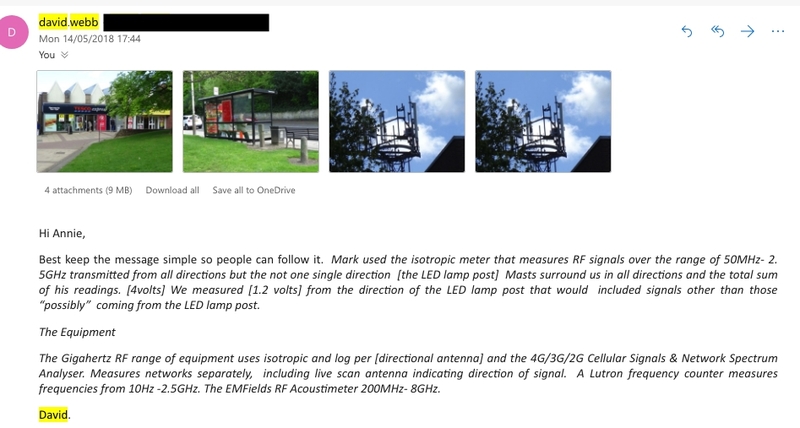 As a concerned member of the public I wanted to find ‘experts’ who could explain to myself and others, exactly what was happening in Gateshead, with claims being made that the lampposts were operating with 5G signals. I contacted a man who was a member of an organisation called BEMRI which stands for Bio-Electromagnetic Research Initiative. That man was named Mr David Webb. To which I received the above reply. As you can clearly see, this reply shows that this man was replying as a member of BEMRI. He also states that himself and another member of that group had phoned Steele on several occasions to offer their services freely. 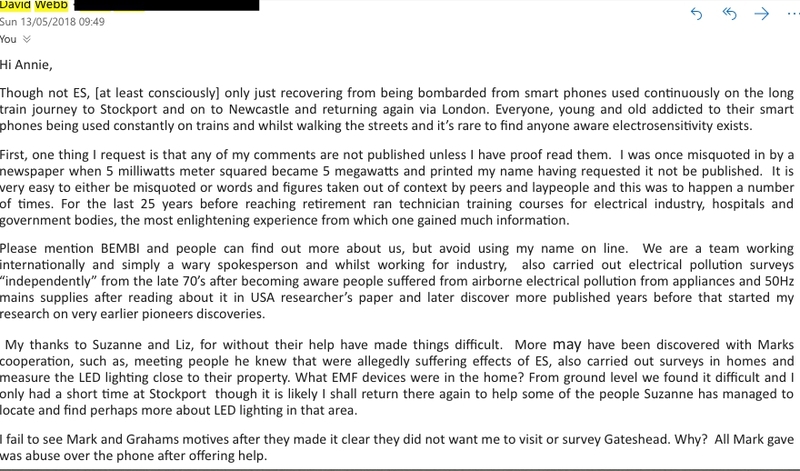 I then arranged in May, for this man to meet up with a lady who lived close to the area that had been tested in Gateshead, her name is Lizbeth. She spent several hours with the man from BEMRI and the lampposts were tested with equipment that was professional and up to the job. 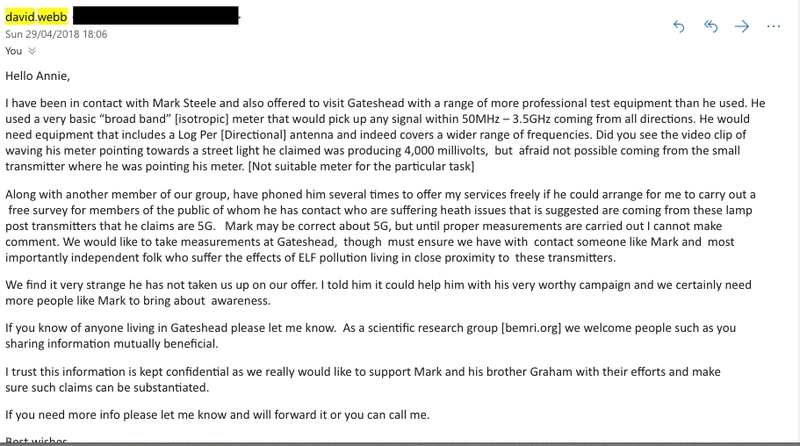 This email was sent to me after David had visited Gateshead and Stockport. That email clearly states that I should mention BEMRI but not David personally. So why am I mentioning his name now? Because last month, March 2019 which is nearly a year after these tests were completed, BEMRI have issued a public statement to Mark Steele in which they state that BEMRI is NOT responsible for any of the test results, and that anyone who makes claims that BEMRI are involved are misleading the public. David has since retired from BEMRI. Does that negate the fact that he corresponded with me as part of BEMRI? I do not feel that it does. So after hearing of this latest development, I wrote a letter to the founder of BEMRI and informed them that David had conducted the tests on behalf of BEMRI, which I have in writing. I also told them that I believed that they had acted inappropriately to release a public statement claiming that it was nothing to do with BEMRI. I was then threatened with legal action If I pursued this. Back in May I also sent this email. This is the reply that I received, even though David had told me that he had made a report to BEMRI. The above is a copy of the original report sent by David. He informed me on the phone previously that he made made a report for BEMRI as he does with every test he carries out. I then received this email. I have no choice but to make these emails public because of the actions of BEMRI in releasing a public statement claiming that they are not in any way responsible for the tests carried out by their own member, a member who has consulted and communicated with both myself and the lady who accompanied him whilst the test were being carried out, and has done so and clearly informed us that he was testing as a member of this group and NOT as an independent person. Alasdair is a renowned scientist and expert who has links to BEMRI but is not a member. After asking David to give a more updated and comprehensive report he stated that he was very busy so I summed it up and asked for his approval. Do you see? I tried to sum it for him as he was too busy, I specifically stated that I had contacted BEMRI, I shared his original report again, (written by him) and had summed up that BEMRI wished to cease contact in any further matters relating to Steele and his findings, and he replied that this was fine. He offered to provide more information when he had the time. Some months went by with us both corresponding on different aspects of 5G and he often sent me information to include on my website. 5 months later, I was being asked to provide the report that was official, so I contacted David again. He agreed to provide a report on the phone, then sent me this. So after communicating with myself and Lizbeth and testing Gateshead lampposts and doing so as a member of BEMRI, he then informs us that members of BEMRI do not want this information to be shared and he cannot go against the rest of his group. He then sent the test results to Lizbeth who had accompanied him on the day of the testing but not to me. 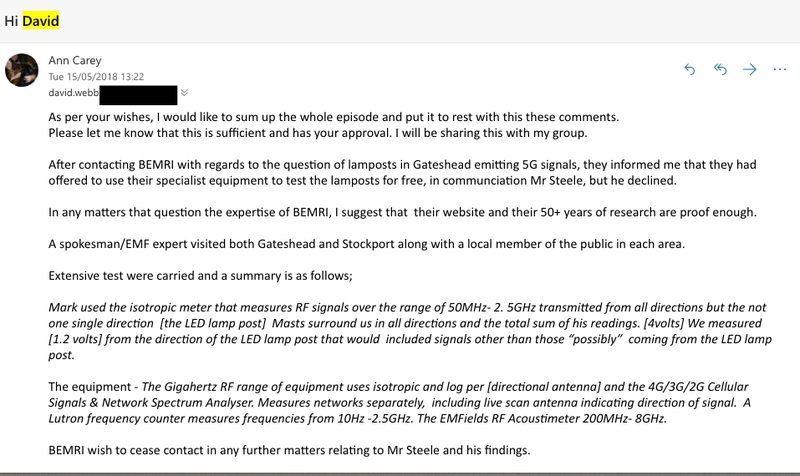 As you can see from that report it clearly states that BEMRI visited Gateshead to test, so where does that leave us? BEMRI spokesperson is insisting that it was never done by their organisation, the member of BEMRI who corresponded on their behalf has retired and I am being called a liar. So, you can decide for yourself and I will gladly face any legal action that members of BEMRI decide to take on this matter because as far as I am concerned, the testing was carried out by a member of BEMRI which clearly is shown by the correspondence. Do you have a link to the man of steels conviction please.